Let’s be clear right from the beginning. 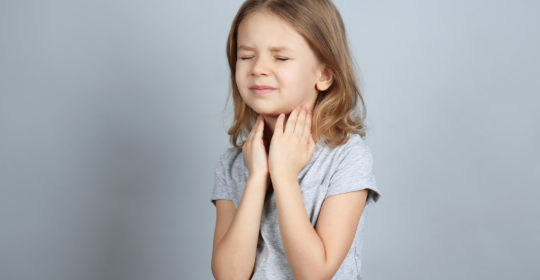 Sore throat in children can only be attributed to strep 15-30% of the time. This means that the vast majority of throat pain is caused by… all together now… A VIRUS! To review, antibiotics are useless against viruses. These sore throats are best treated with fluids, ibuprofen, and time. Strep pharyngitis (fancy, doctor word for ” inflamed throat”) is an infection of the throat caused by a bacteria called Group A Streptococcus (GAS). Little known fact: if left alone strep throat will resolve by itself in 2-5 days. That is right, if we do nothing and your child has strep it will simply run its course within a week. So, why do we worry about it so much? Like any bacteria if left alone there is a chance that it can become worse before it gets better resulting in big pockets of infection (abscesses) in the throat as well as other invasive infections. More importantly, untreated GAS is linked to the development of rheumatic fever. Rheumatic fever is an illness which results in fever (duh!) and joint pain (hence the rheumatic) as well as neurologic and skin problems. Most concerning is that over time it can cause weakening of the heart valves. Treating strep with antibiotics in a timely manner prevents this from happening. Rheumatic fever is very rare in the United States nowadays but is still a problem in other parts of the world. This is a tricky question because it is not easy to tell the difference between a sore throat caused by a virus from one caused by GAS based on symptoms or physical exam. Scarlet Fever is a rash that only occurs with strep throat but not all children with strep throat get scarlet fever. It results from a reaction in the skin to an exotoxin released by the strep bacteria. The rash usually starts on the head and neck and may be accompanied by pallor around the mouth and a strawberry tongue. It usually spreads quickly to cover the body, arms and legs. The rash is red but turns white if you press on it. It is made up of a lot of small raised bumps. If you rub it with your hand it feels rough, kind of like sandpaper. Once on antibiotics the rash should improve but it may take up to 2-3 weeks before it fully goes away. As the rash fades, peeling may occur especially around the fingertips, toes and groin area. Due to the difficulty in identifying strep from its viral counterparts the only way to tell for sure if it is strep is to test for it. This requires swabbing the tonsils and the back of the throat with a q-tip to collect germs to see if strep is among them. The accuracy of the swab is of utmost importance. If the child is fighting, kicking, and biting so the swabber only gets the front of the mouth it is no good. There are two tests for strep. One is a rapid test which gives results within minutes. The drawback to the rapid test is that it can sometimes give a false negative result. This means that if the rapid test is positive than it is positive and your child has strep throat, however, if the rapid test is negative there is a chance that it could still be positive. In these cases the result should be followed up by a throat culture which is the gold standard for diagnosis. The germs from the back of the throat are placed in an incubator. If strep grows it is positive, if not, negative. The drawback to this test is that you have to give the little buggers time to grow. Usually you can see something in 24 hours but you may have to watch it for up to 48 hours to be sure. Children without fever or with viral symptoms should not be tested. Strep throat occurs most commonly in school-age children 5-15 years of age during the winter and early spring. Studies show that school-age children have a 37% chance of being positive for strep compared with 24% for children less than 5. This number is significantly lower for children under 3 at only 10-14%. Not only are these young children less likely to contract strep throat, reports of rheumatic fever in this age group are very rare. This is probably because it takes repeated exposures to GAS to create an immune response to streptococcal pharyngitis that can lead to rheumatic fever. As a result, routine testing for strep throat in children less than 3 is generally not indicated. The exception to this rule is a symptomatic child <3 years of age with a school-aged sibling who has a positive throat culture or attending a daycare facility experiencing an outbreak. It should be noted that GAS infection in children <3 years old looks different than in older brothers and sisters and is often associated with fever, runny nose, excoriated nostrils and tender, swollen lymph nodes. Studies show that the likelihood of the spread of GAS infection among family members is only 25%. Due to this fact, if one of your kids is positive for strep it does not make sense to swab your other children or to treat them with antibiotics if they have no symptoms. Given the self-limited nature of GAS pharyngitis, the increase in resistance to antibiotics, and the difficulty in diagnosing strep clinically, only children proven to have strep with a positive test should be started on medicine. If the rapid test is negative treatment should not be started unless the culture grows out strep in the end. Penicillin/Amoxicillin is the treatment of choice for strep throat due to the fact that it has been proven effective, safe and it is inexpensive. In fact, penicillin-resistant GAS has never been documented. Alternatives are available for those with a documented allergy to penicillin. Clinical improvement is generally seen after 24-48 hours on antibiotics. After 24 hours of treatment your child is no longer contagious and may return to school. After 24 hours of treatment you should replace your child’s toothbrush to prevent reinfection. Not completing the whole course of the original antibiotic as prescribed. Sometimes it is hard to remember to finish the whole 10 days when your child feels better within 1-2 days but it is important to give all the medicine to make sure the bacteria is completely eradicated from the throat. Some research has shown that starting antibiotics within 1-2 days of the onset of illness more frequently results in recurrence of symptoms within a month of treatment. Starting antibiotics early may not allow the body time to produce its own antibodies against GAS resulting in relapses and recurrent illness. In one study, recurrent infection within one month occurred twice as frequently among patients treated immediately than among patients with a delay in treatment of > 2 days. In order to prevent rheumatic fever, treatment needs to be started within 9 days of the onset of illness so waiting a day or two is not detrimental. In other words, strep throat is not an emergency and does not necessitate a visit to Urgent Care or the ER. It is always best to be seen by your doctor for continuity of care whenever possible. During the winter and spring months, as many as 20% of asymptomatic school-age children may be GAS carriers. These carriers are unlikely to spread the organism to their close contacts and are at very low risk, if any, to develop complications. They may be colonized for >6 months. Seeing as the common cold is so common, we would expect them to come down with a viral illness in that time which would result in a sore throat. If they are then tested for strep the test will be positive and they will be treated, unnecessarily, with antibiotics. This is an important reason to be careful about bringing your child in for a strep test if they have viral symptoms. It is hard to determine who is a carrier although carrier status is more likely if a strep test is positive at a time when they do not have symptoms. It is unnecessary to try to rid these children of the strep with antibiotics as the strep they are carrying poses no threat to them or those around them. For patients with as many as six GAS infections in a single year or three to four episodes in two consecutive years, tonsillectomy may be considered. If you have questions about whether your child with a sore throat should come in for a strep test call us at 301-279-6750.